A Texas National Guardsman carries a resident from her flooded home following Hurricane Harvey in Houston, August 2017. Army National Guard photo by Lt. Zachary West. We know that storm surges due to tropical cyclones have been enhanced by climate change. Over the past week we have seen two major tropical storms devastate different parts of the world. First Typhoon Hato struck Hong Kong and Southern China killing at least a dozen people. And over the weekend Hurricane Harvey made landfall from the Gulf of Mexico, bringing extremely heavy rain to southern Texas and causing devastating floods in Houston. Tropical cyclones are, of course, a natural feature of our climate. But the extreme impacts of these recent storms, especially in Houston, has understandably led to questions over whether climate change is to blame. How are tropical cyclones changing? Tropical cyclones, called typhoons in the Northwest Pacific and hurricanes in the North Atlantic, are major storm systems that initiate near the Equator and can hit locations in the tropics and subtropics around the world. 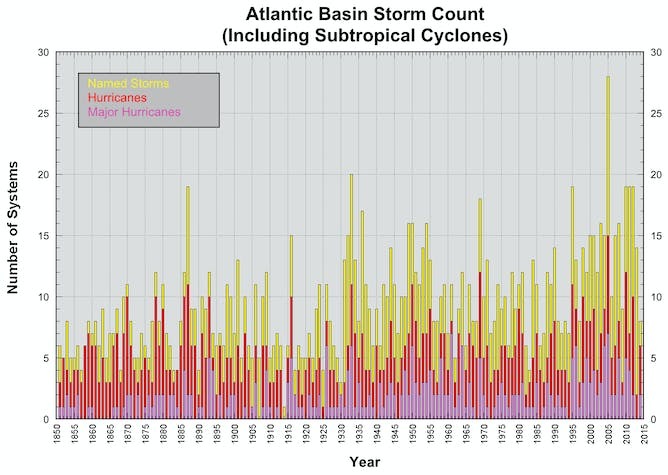 When we look at the Atlantic Basin we see increases in tropical storm numbers over the past century, although there is high year-to-year variability. The year 2005, when Hurricane Katrina devastated New Orleans, marks the high point. We can be confident that we’re seeing more severe tropical cyclones in the North Atlantic than we did a few decades ago. It is likely that climate change has contributed to this trend, although there is low statistical confidence associated with this statement. What that means is that this observed increase in hurricane frequency is more likely than not linked with climate change, but the increase may also be linked to decadal variability. Has Harvey been enhanced by climate change? Unlike other types of extreme weather such as heatwaves, the influence of climate change on tropical cyclones is hard to pin down. This is because tropical cyclones form as a result of many factors coming together, including high sea surface temperatures, and weak changes in wind strength through the depth of the atmosphere. These storms are also difficult to simulate using climate models. To study changes in tropical cyclones we need to run our models at high resolution and with interactions between the atmosphere and the ocean being represented. It’s much easier to study heat extremes, because we can do this by looking at a single, continuous variable: temperature. Tropical cyclones, on the other hand, are not a continuous variable; they either form or they don’t. This makes them much harder to model and study. Tropical cyclones also have many different characteristics that might change in unpredictable ways as they develop, including their track, their overall size, and their strength. Different aspects of the cyclones are likely to change in different ways, and no two cyclones are the same. Compare that with a heatwave, which often have similar spatial features. For all these reasons, it is very hard to say exactly how climate change has affected Hurricane Harvey. While it’s hard to pin the blame for Hurricane Harvey directly on climate change, we can say this: human-caused climate change has enhanced some of the impacts of the storm. Fortunately, in Harvey’s case, the storm surge hasn’t been too bad, unlike for Hurricanes Katrina and Sandy, for example. This is because Harvey did not travel as far, and weakened rapidly when it made landfall. We know that storm surges due to tropical cyclones have been enhanced by climate change. This is because the background sea level has increased, making it more likely that storm surges will inundate larger unprotected coastal regions. Building levees and sea walls can alleviate some of these impacts, although these barriers will need to be higher (and therefore more expensive) in the future to keep out the rising seas. Harvey’s biggest effect is through its intense and prolonged rainfall. A low pressure system to the north is keeping Harvey over southern Texas, resulting in greater rainfall totals. The rainfall totals are already remarkable and are only going to get worse. We know that climate change is enhancing extreme rainfall. As the atmosphere is getting warmer it can hold more moisture (roughly 7% more for every 1℃ rise in temperature). This means that when we get the right circumstances for very extreme rainfall to occur, climate change is likely to make these events even worse than they would have been otherwise. Without a full analysis it is hard to put exact numbers on this effect, but on a basic level, wetter skies mean more intense rain. There are other factors that are making this storm worse than others in terms of its impact. Houston is the second-fastest growing city in the US, and the fourth most populous overall. As the region’s population grows, more and more of southern Texas is being paved with impermeable surfaces. This means that when there is extreme rainfall the water takes longer to drain away, prolonging and intensifying the floods. Andrew King is an Climate Extremes Research Fellow at the University of Melbourne. This article was originally published on The Conversation. Read the original article.